CORPUS CHRISTI, TX – Our stunning bayfront will come alive when the 28th Annual Summer Bay Jammin’ Concert Series at Cole Park Amphitheater kicks off on June 1st. Live concerts by local favorites and other notable Texas bands will be featured. Music lovers of all ages can experience a wide variety of genres that include Alternative Rock, Country, Reggae, Jazz, R&B, and more. The Corpus Christi Parks & Recreation Department’s Cultural Services, Cricket Wireless, J² Productions, Redding Communications, Executive Surf Club, and many other local businesses invite you to relax under the stars while enjoying a weekly variety of musical entertainment. “Many of you have also supported this summer series through the GoFundMe account. It is so wonderful to receive your generous support,” said concert series organizer John Joseph Nelson. Get your family and friends together and come on out to be part of a summer tradition that has been jammin’ since 1989. Don’t forget to bring along your lawn chairs or your blankets. 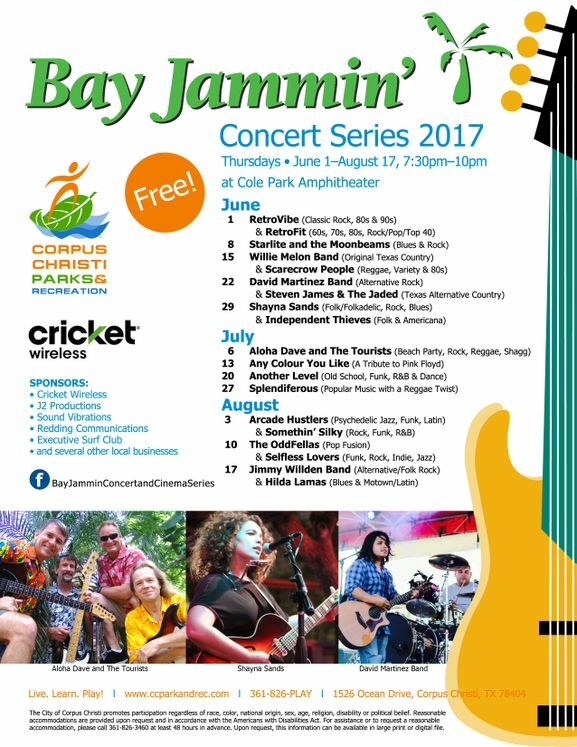 Bay Jammin’ Concert Series will be held on Thursdays, June 1 through August 17, 2017, from 7:30pm to 10pm. For more information, “like” us on Facebook at https://www.facebook.com/BayJamminConcertandCinemaSeries or call 361-826-PLAY.